When it’s time to build or upgrade a data center, what hardware and software do customers and service providers typically embrace? 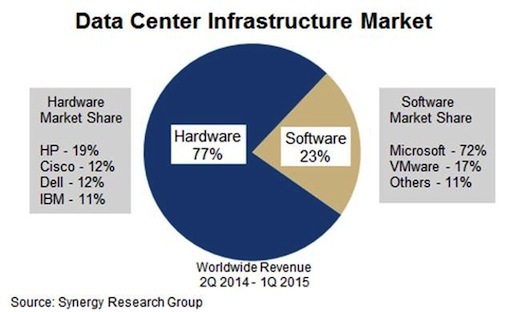 The answers — involving data center infrastructure market share figures — surprised me. Indeed, HP is the leading data center hardware infrastructure provider (with 19 percent market share) while Microsoft leads on the software side (72 percent), according to Synergy Research Group figures tracking 2Q 2014 through 1Q 2015. 1. HP’s hardware figures are likely heavily weighted toward servers, with some networking and storage mixed in. But HP’s networking and storage units haven’t exactly lit the world on fire in recent quarters. 2. I wonder about the overall mix of converged hardware (servers, storage, networking) from each of the hardware providers — especially now that IBM has sold off its x86 server business to Lenovo. 3. Although Oracle doesn’t rank among the top four data center hardware infrastructure providers, you can’t eliminate Engineered Systems from this conversation. 4. On the software side, Microsoft’s dominance seems a bit misleading to me. Yes, Windows Server is incredibly popular. But the research doesn’t really represent free and open source solutions very well. And we all know Red Hat, Ubuntu Linux, and other open source platforms are nearly ubiquitous (in paid and unpaid formats) in large data centers. 5. EMC is a potential “hidden winner” here — with its play in storage hardware (market share figures undisclosed) and it’s major ownership stake in VMware on the software side. Overall, Synergy Research Group’s data suggests that the more the world changes — cloud, big data, social, mobile — the more corporate IT depends on traditional big-name infrastructure players to power their data center workloads.